Shoo-ey it's hot! and it's humid! Extraordinarily high temps started a couple of weeks ago. The tough thing is we are not cooling down at night. Walk out first thing in the morning or even late at night and the air hits you like a stifling blanket. With summer officially upon us we can be pretty sure it is here to stay. A little rain would be nice to give the plants some relief. There are a few flowers that like it hot. My first attempt with Indian Blanket Flower Gaillardia pulchella from American Meadows seed is happy about dry, hot conditions. They even do well in beach locations. Some fading zinnias sown from seed mixed in with the little patch of wildflowers in a rare sunny corner. Of all the colors of Cosmos, decidedly this deep magenta hue is my favorite. Cosmos don't seem to mind very little water. The bushy shrubs of Pagoda flowers, Clerodendrum paniculatum, have made a comeback after being taken to the ground by the frost this winter. 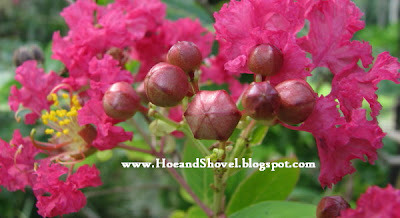 The hot pink Crape myrtles are just beginning to bloom. White ones are my personal favorites. 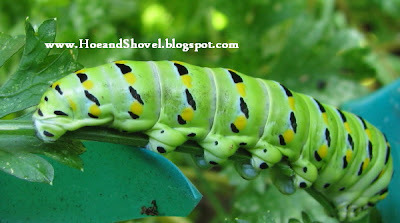 The Swallowtail larva is more mature today than last week when we first spotted them on the parsley in the vegetable garden. I watched today as more butterflies were laying eggs on them the parsley just today. More eggs, more caterpillars, more butterflies. Woo-hoo. It's a good thing more milkweed was planted a couple of weeks ago. The monarchs have already found them. I counted 4 larva at different stages of maturity chomping away this morning. My new favorite coleus. Combined here with Iresine, blood leaf started from cuttings the two of them together blend nicely next to Miss Muffet caladiums. 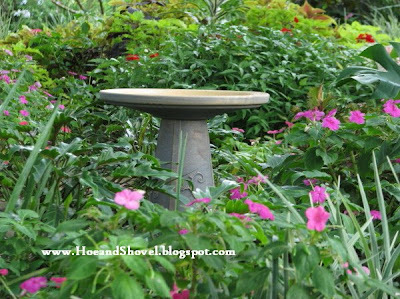 With our rain-less June and summer heat I'm thinking the birdies are very happy I finally broke down and purchased yet another bird bath. Here's hoping you are staying cooler than we are while we garden. Happy summer. It is hot here too Meems. When I wake to find condensation on the windows in the morning I know it is hot and will stay hot. UGH... 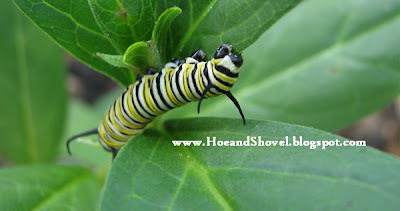 It looks like you are going to have lots of butterflies in your garden this summer. I just love Gaillardias planted them a few times from seed. Now Meems you need to come down to the islands. It is cooler in the mornings and evenings down here. There is also a constant breeze most of the time. Just came in from the garden collecting fallen limes and it was lovely. Thanks so much for stopping by and I have to say I'm enthralled with the colorful caterpillars. So happy you are enjoying your summer warmth. Your weather now is most likely like our winter weather... warm without humidity. It will be a long while before we have mild days again. I'm so sorry you are hot all the way up in Indiana. UGH is right. Surely it will not hang on there like it does here. We actually got down to 78 degrees over night... that's an improvement. Oh, and we got some rain. Big improvement. Good morning. I can just 'hear' you saying, "now, Meems..."
Your description is just how imagine 'island life' to be ,dear Helen. Wouldn't it be nice if a trip for some cool morning air was on the horizon. I must check with Marie to see if she has figured that one out. Have a wonderful morning. I'm heading out now to get a head start on the ninety degree temps. That is a beautiful cosmos! Glad to see your Pagoda came back. I think you'll really enjoy the blanket flowers. When I bought my first ones, they were supposed to be solid yellow. They turned out burgundy/gold. At first, I didn't like them, but now I love them. They bloom and bloom all summer long into the fall. I even like the centers when the petals are gone. Besides gathering seeds, they divide so easily. They almost fall apart into many small plants. I don't know where our butterflies are this year. I've seen one Monarch, one Black Swallowtail and only one Tiger. There have been a few others, but nothing like the swarms from past years. Too wet here? That's what I'm wondering. Stay cool! We spent all of yesterday outside. After my morning gardening and my husband's morning run, we were in/out of our pool until 5:00. I love the coleus and iresine together! No iresine for me this summer and I miss it. I tried to overwinter it but no go. I had better luck with it the previous winter. It's hard to come by around here. The deep magenta is my favorite color of the cosmos too. We've had abundant rain and not enough warmth. Too bad we couldn't mix our weather up for a happy medium :) This lovely day promises to be the second in a row that actually feels like summer might finally be here. Praying for rain for your beloved Florida, Meems. Happy summer! Meems your crepe myrtles are very pretty, are there two types in Florida? Mine don't seem to do well, we used to call them queen of flowers in Grenada. At least the birds will be happy to get some relief thanks to you. The pagoda flower is divine I think. Just imagine it was only last year I discovered it. Your coleus are vibrant, I cant seem to grow them very well so I don't bother with them. 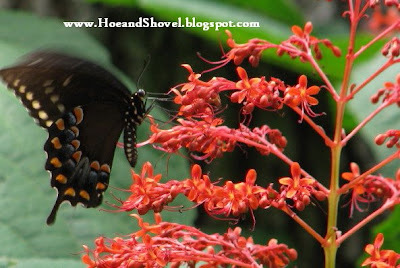 Zinnias do give a garden an olde world feel and the butterflies just love them. Take care and stay cool. 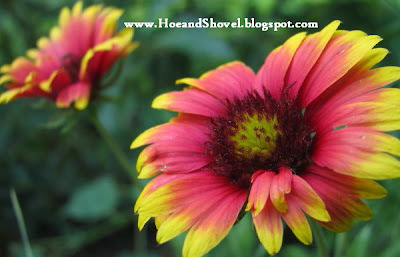 I too like the centers of the Gaillardia and if they bloom all summer I'll be really glad. The first year is always a trial... we'll see how they fare for the long haul. I have a feeling you'll start seeing your butterflies real soon now that the rain has cleared out. They want your milkweed! Just got out of the pool- the little one had a swimming lesson today... and I just went in for a cool down... now I'm back outside to get some more gardening done. What a life saver the water can be. Enjoy your day! I don't know the answer to your question right off ... I can do a little research. I know I had a dwarf crepe once and didn't like it. My white one is much bigger than the fuschia colored ones. I like them because I don't do anything to them EVER and they just always show up faithfully. 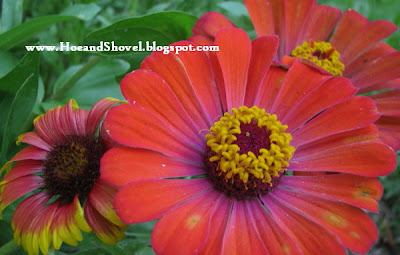 The zinnias do well here until it gets really humid and then they don't seem so happy. The leaves seem to be the dinner choice for the slugs, too. But I'm happy with the turn out I've had this year... both in the back and in the veggie garden. I hope you get some significant rain soon! So much pretty color. The first two flowers are almost the exact same colors in reverse. Hope it does cool down for you a bit. It is a shame the heat doesn't seem to bother the mosquitoes, huh? Those colors are bright spots in the sunny corner garden... so bright and cheery. It's not likely to cool down too much... this is kind of how it goes for the next few months. I promise not to mention it too often. waaaa! Gone indeed unless hanging out in the pool. Went in three times today. Well, the first time was with the 3 yr old and the second with the 6 yr old tonight (she loves to swim at night). Nevertheless it is very refreshing in this heat. I know that heat is not something TN likes to have at night. It should pass for you though with a little shift in the weather... let's hope anyway. You've got me wondering if your zinnia seeds floated away with all the rain you had in the spring. So true... not only does it not bother them ...it encourages them! You take some amazing photographs. Thanks for letting me into your garden. Hi Meems, It's hot here also--but probably not as hot as your temps. Last weekend it was much worse here--mainly because of the humidity. BUT--I just checked and it says that we are 87 right now. YUK!!!!! Your flowers are still gorgeous. I love that magenta Cosmos. WOW!! And--the Crape Myrtles are also beautiful. Well my friend, stay COOL.... I'll try to do the same. Your website is very informative. I have so many bromeliads that I have no idea what the cultivar is... they are much beloved around here. It seems everyone was getting the heat that we typically have all summer. Honestly, I can take the heat... it is the high humidity that makes me gasp for air. All is well anyway... we just plow through it with an occasion whine. Such are the weather patterns but the garden and the gardener goes on. Have a wonderful weekend. we have another hot one on the schedule for today. i am trying to be grateful for the sunshine/heat as opposed to the grey/sunshineless days of cold winter. i love the colour blanket flower you chose...so refreshingly bright. 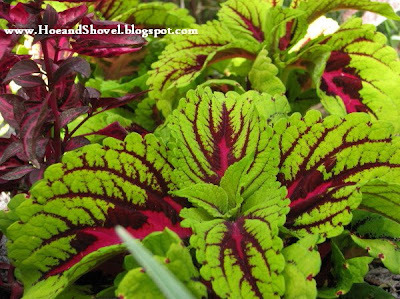 the coleus comes in endless varieties...i love yours...my personal favourite right now is chocolate mint. isn't it great seeing all the caterpillars knowing that you will have more butterflies soon...great shots of them. 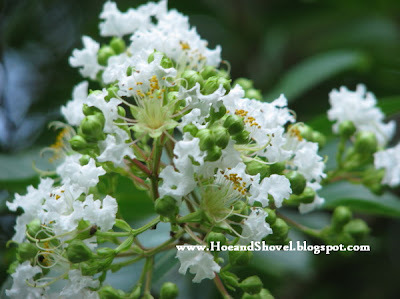 i was trying to remember when to expect the crepe myrtles again...i hope i get some blooms on the ones i thought didn't make it. i love them all. i do love the deep colour of your cosmos. 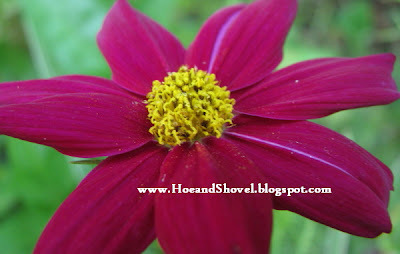 hope you can withstand the heat to enjoy some gardening. I must get that Blanket Flower! Also like how you mixed ot with the hot zinnias. Good to see those caterpillars in your garden, I planted several milk weeds around my garden, and the butterflies always find it. Lovely, Meems, now that's a Florida garden! Thanks for your comment on my page. My little terrace of brightly colored flowers may look like a piece of Florida for a reason - I grew up in Sarasota. Wonderful memories of the tropical flowers, but I don't miss the humidity! It is a wonderful color isn't it? And believe me, it roots very easily by just putting cuttings directly in the soil. I can't wait to see if the blanket flower does well all summer. It will be a keeper if it does... well, it will probably always have its place here even if it doesn't because of the hot colors it provides even if for a short while. The butterflies are eating the milkweed so fast I think I might need to go get even more. I've also noticed they are popping up in other places in the garden... some self sown plants. I like that. I LOVE Sarasota and the tropicals grow so freely down there... only a short distance S. from here. (It's a small world isn't it)! No wonder you have a knack for those brightly colored flowers. The last time I was in Denver it was in July. The mornings started out with dry high 60's and the evenings were delightful. It got hot during the day but with no humidity it was sooooo different than the heat here. I don't blame you for loving it there. It looks like your blanket flowers are doing well. They are a terrific little plant - perfect for Florida. I love the white crapes, too - especially the Natchez variety.